False pride consists essentially in an extremely high and unchanging evaluation of oneself. The criminal thinker uses the word respect to describe the behavior they require from others to affirm and support their false pride. In order to address false pride, the criminal must adopt a self-critical attitude as a route toward realistic expectations of themself and the world. Self-criticism will also help in developing and attaining goals, and in creating a basic humility with reference to their position in the larger scheme of things. Self-examination must also involve the review of nonverbal behavior. Gestures such as rolling one’s eyes, pushing out the chest and folding one’s arms, for example, are condescending and falsely superior. The very concept of manhood, or womanhood, must be redefined. This essential identification should be seen as the pursuit and growth of a responsible lifestyle which includes elements such as reliability, honesty, integrity, humility, purposefulness and value to others, among other things. It is particularly of note that the male criminal’s relationships with women should be examined for the existence of dominant behavior, which is related to false pride. 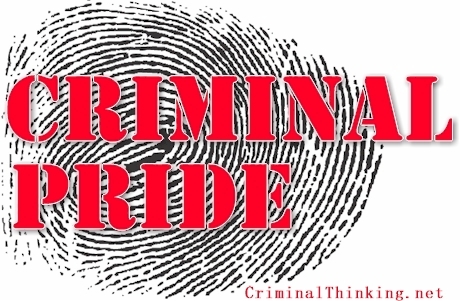 This entry was posted in Thinking Change, Thinking Errors and tagged criminal pride, criminal thinking, false power, false pride, thinking change. Bookmark the permalink.